The use of computational methods for ancient world geography are still very much dominated by the URI based gazetteer. These powerful and flexible reference lists, trail-blazed by projects such as the Pleaides and Pelagios projects, allow resources to be linked by common spatial referents they share. However, while computers love URIs unconditionally, the relationship they have with place is more ambivalent: a simmering critical tension which has given rise to what we call the Spatial Humanities. This critical tension between the ways humanists see place and the way computers deal with it has highlighted important geo-philosophical principles for the study of the ancient world. For me, one of the most important of these is the principle that places as entities which exist in some form of human discourse such as text, and places as locations which can be situated within the (modern) framework of latitude and longitude, must be separated. Gazetteers allow us to do this, which is why they are so important. Ancient geographies should be seen in the context of hodological space – as pathways through the world, not points on top of it. Hodology, a concept discussed by several speakers, views space from the perspective of experience and mobility. Hodological space concerns the tension between intent, possibility, and real (embodied) experience. It is frequently bidimensional, as evidenced in the example given by Sergio Brilliante, of western Crete in the Periplus (mariner’s account) of Pseudo-Skylax, which displayed the best route for travel, not the cartographically optimal one. I was struck by the modern parallel of the WWII Cretan “runner”, George Psychoundakis, who, in his riveting account of his role in the resistance in Crete, measured the distances over which his wartime missions took him on foot by the number of cigarettes he smoked on the journey. It was noted that in Arabic scripts, geographic areas are generally not measured, except for the purposes of agriculture. A hodological approach was described as a counterpoint to “scientific method” in geography: one can frame geographic accuracy either in terms of “accurate” Cartesian maps, or as the consistent application of geo criteria. Like any form of humanistic space, hodological space is never neutral. Place references in humanistic discourse are often the result of mutivocal, multi-authorial and partial accounts; and the workshop bore a heavy emphasis on this. Many surviving Classical texts are written by Greek or Athenian authors, so there is a strong Athenocentricism and Graecocentricism to them. Non-Greeks tend to be “hidden”. This seemed to me somewhat reminiscent of the Mercator projection (which most modern Web cartography relies upon), which “shrinks” mid-latitude countries and accentuates those at higher and lower latitudes, thus visually privileging the developed world at the expense of the developing countries (who could forget the scene in the West Wing when the Cartographers for Social Equality regale CJ Cregg on the subject). Similarly toponyms are not neutral, a problem which the separating of platial concept and platical location can help address. Our own Heritage Gazetteer of Cyprus is attempting to do this through application of “attestations” of agnostic geographic entities, an approach also being used by Sinai Rusinek in her Hebrew gazetteer. Similarly Thomass Carlson described the Syriaca.org gazetteer, which links cultural heritage to texts in the Syriac language. Carlson noted that names are a linguistic strategy not absolute entities. The nature of names means that disambiguation does not work consistently. Even an expert reader might not be able to determine out what exactly a toponym refers to. While many ancient world gazetteers rely on URIs, URIs can never replace unambiguous linguistic names. Context free URIs, which the gazetteer community has long relied on, are no longer sufficient to represent non-neutral humanistic place. Finally, a point well made by Maurizio Lana was that geographical ontologies must be bottom up to be truly representative. In his presentation he described the Geolat project, which deals with the use of spatial ontologies, and again frames names as cultural patterns. There is a driving force which pulls readers towards names, to what is easily identifiable. It is necessary to separate the study of entities from naming. This means that an ontology that is developed for one purpose might not be suitable for others. 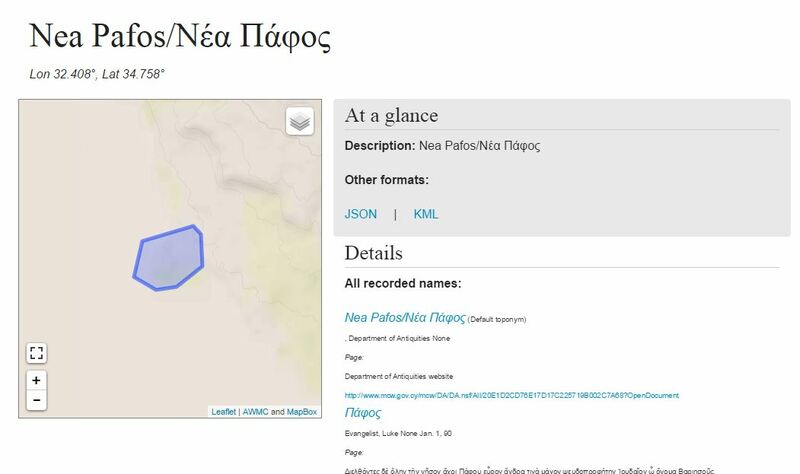 For example, in the Heritage Gazetteer of Cyprus we make use of Geonames as a means of locating archaeological entities, but the Feature Type list of Geonames is not nearly detailed or granular enough to adequately describe the different kinds of features which exist in the gazetteer. Therefore where geo-ontologies have come from, and why they do not align, can lead to very interesting conclusions about the nature of historical spatial structures. As often, there was a great background discussion with colleagues who were not physically present via Twitter, which I have captured as a raw Storify. Among the most engaging of these discussions was an exchange as to whether a place had to have a name, or rather whether place acts as a conceptual container for events (in which case what are they?). My previous belief in the former position found itself severely tested by this exchange, and the papers which touched on hodological views of the past provided reinforcements. I think I am now a follower of the latter view. Thank you to those Twitter friends for this, you know who you are. Back in April, I gave a talk at a symposium entitled Finding New Knowledge: Archival Records in the Age of Big Data in Maryland called “Of what are they a source? The Crowd as Authors, Observers and Meaning-Makers”. In this talk I made the point that 2016 marked ten years since Jeff Howe coined the term “crowdsourcing” as a pastiche of “outsourcing” in his now-famous Wired piece. I also talked about the saga of “Boaty McBoatface”, then making headlines in the UK. If you recall, Boaty McBoatface was the winner, with over 12,000 votes, of the Natural Environmental Research Council’s open-ended appeal to “the crowd” to suggest names for its new £200m polar research ship, and vote on the suggestions. I asked if the episode had anything to tell us about where crowdsourcing had gone in its first ten years. Well, we had a good titter at poor old NERC’s expense (although in fairness I did point out that, in a way, it was wildly successful as a crowdsourcing exercise – surely global awareness of NERC’s essential work in climatology and polar research has never been higher). In my talk I suggested the Boaty McBoatface episode was emblematic of crowdsourcing in the hyper-networked age of social media. The crowdsourcing of 2006 was based, yes, on networks, enabled by the emerging ubiquity of the World Wide Web, but it was a model where “producers” – companies with T-Shirts to design (Howe’s example), astrophysicists with galaxy images to classify (the Zooniverse poster child of citizen science), or users of Amazon Mechanical Turk put content online, and entreated “the crowd” to do something with it. This is interactivity at a fairly basic level. But the 2016 level of web interactivity is a completely different ball game, and it is skewing attitudes to expertise and professionalism in unexpected and unsettling ways. The relationship between citizen science (or academic crowdsourcing) and “The Wisdom of Crowds” has always been a nebulous one. The earlier iterations of Transcribe Bentham, for example, or Old Weather, are not so much exercises in crowd wisdom, but perhaps “crowd intelligence” – the execution of intelligent tasks that a computer could not undertake. These activities (and the numerous others I examined with Mark Hedges in our AHRC Crowd-Sourcing Scoping Survey four years) ago all involve intelligent decision making, even if it is simply an intelligent decision as to how a particular word in Bentham’s papers should be transcribed. The decisions are defined and, to differing degrees, constrained by the input and oversight of expert project members, which give context and structure to those intelligent decisions: a recent set of interviews we have conducted with crowdsourcing projects have all stressed the centrality of a co-productive relationship between professional project staff and non-professional project participants (“volunpeers”, to use the rather wonderful terminology of the Smithsonian Transcription Center’s initiative). Independence is important to intelligent decision making for two reasons. First, it keep (sic) the mistakes that people make from becoming correlated … [o]ne of the quickest ways to make people’s judgements systematically biased is to make them dependent on each other for information. Second, independent individuals are more likely to have new information rather than the same old data everyone is already familiar with. According to the Economist’s data, the Brexit vote certainly has some of the characteristics of information cascade as described by Surowiecki: many of those polled who voted that way did so at least in part of their faith in the “wisdom of ordinary people”. This is the same self-replicating logic of the NERC boat naming competition which led to Boaty McBoatface; and a product of the kind of closed-loop thinking which social media represents. Five years ago, the New Scientist reported a very similar phenomenon with different kinds of hashtags – depending on the kind of community involved, some (#TeaParty in their example) develop great traction among distinct groups of mutual followers with individuals tweeting to one another, whereas others (#OccpyWallStreet in this case) attract much greater engagement from those not already engaged. It’s a pattern that comes up again and again, and surely Brexit is a harbinger of new ways in which democracy works. It is certainly embodies and represents the information cascade as one key aspect that Surowiecki would have us believe is not the Wisdom of Crowds as a means of making “good” decisions. There may be those who say that to argue this is to argue against democracy, that there are no “good” or “bad” decisions, only “democratic” ones. That is completely true of course; and not for a moment here do I question the democratic validity of the Brexit decision itself. I also happen to believe that millions of Leave voters are decent, intelligent, honourable people who genuinely voted for what, in their considered opinion, was the best for the country. But since the Goves of the world made a point and a virtue of placing the Leave case in opposition to the “opinions of experts”, it becomes legitimate to ask questions about the cognitive processes which result from so doing. And the contrast of this divisive rhetoric with those constructive and collaborative relationships between experts and non-experts evident from academic crowdsourcing could not be greater. But that in turn makes one ask how useful the label “expert” really is. What, in the rhetoric of Gove, Davies etc, actually consigns any individual person to this reviled category? Is it just anyone who works in a university or other professional organization? Who is and who is not an expert is a matter of circumstance and perspective, and it shifts and changes all the time. Those academic crowdsourcing projects understand that, which is why they were so successful. If only politics could take the lesson. Pencil sketch, mostly harder pencils. August 2016. 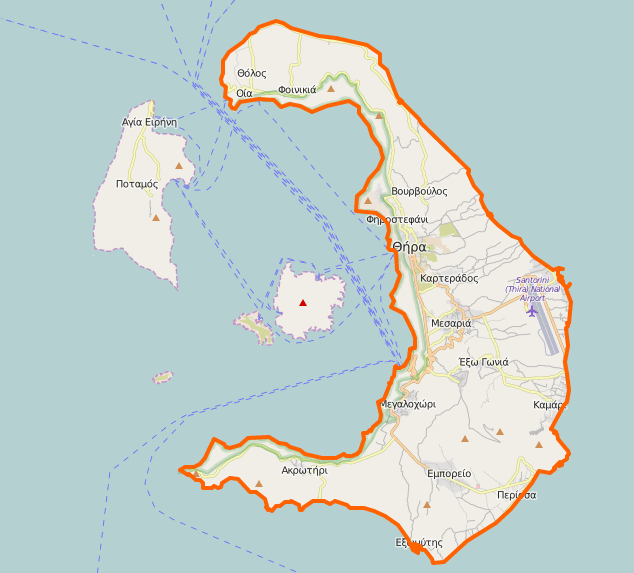 Question: (how) do we map disappeared places? @StuartDunnCeRch @rogueclassicist "living" or "life"
Anyway, having been either ‘living’ or ‘loafing’ a lot these last few months, this is my first post since February. Can such places be hermenutic objects by virtue of the fact that they are representing in the human record (in this case Graves’s map), even though they no longer exist as spatial footprints on the earth’s surface? I suppose they have to be. The same could go for fictional places (Middle Earth, Gotham City etc). What kind of representational issues does this create for mapping in the humanities more generally? 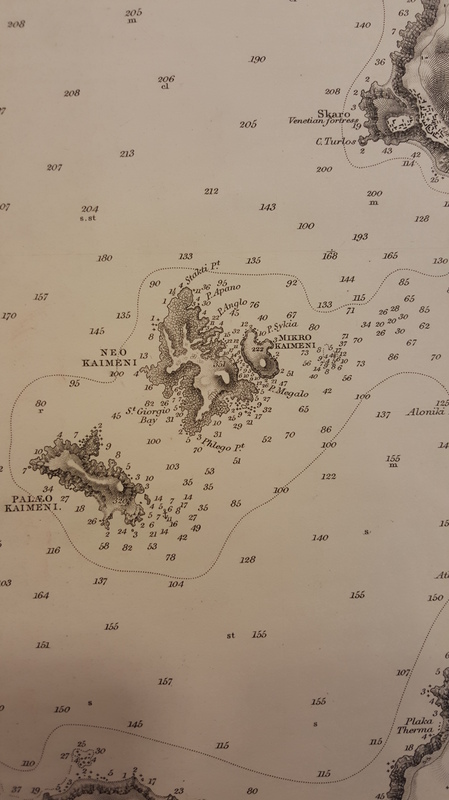 Author stuartdunnPosted on September 2, 2015 September 2, 2015 Categories UncategorizedTags cartography, islands, mapsLeave a comment on Question: (how) do we map disappeared places? King’s Careers & Employability gathers statistics on graduate employment destinations for the Higher Education Statistics Agency (HESA). Such data is available for the Department of Digital Humanities’ cohorts for the three academic years between 2010/11 and 2012/13, that is to say graduates of the MA Digital Humanities, the MA Digital Asset and Media Management and the MA Digital Culture and Society of those years. This information, which includes the sectors and organizations that alumni enter, and their job titles, is gathered from telephone interviews and online surveys six months after their graduation. Of those who graduated in 2012/13, 93.8% were in full time work, with the remainder undertaking further study in some form. 38.4% of those approached did not reply, or refused to provide answers. A certain health warning must therefore be attached to the information currently available; and in the last couple of years the numbers on all three programmes have grown considerably, so the sample size is small compared to the numbers of students currently taking the degrees. But in surveying the data that we do have, it is possible to make some preliminary observations. Firstly, the good news is that all of our graduates from 2012/13 who responded to the survey were in employment, or undertaking further studies, within those six months. In the whole three-year period, MA DAMM graduates entered the digital asset management profession via corporations including EMAP, and the university library sector (Goldsmiths College). They also entered managerial roles at large corporations including Coca-Cola and the Wellcome Trust. Digital media organizations feature strongly in MA DCS students’ destinations, with employers including NBC, Saatchi and Saatchi and Lexisnexis UK, with roles including design, social media strategy and technical journalism. Librarianship is also represented, with one student becoming an Assistant Librarian at a very high-profile university library. Others appear to have gone straight in to quite senior roles. These include a Director of Marketing, PR and Investments at an international educational organization, a Senior Strategy Analyst at a major international media group, and a Senior Project Manager at a London e-consultancy firm. One nascent trend that can be detected is that graduates of MA DH seem more likely to stay in the research sector. Several HE institutions feature in MA DH destinations, including Queen Mary, the University of Oslo, Valencia University, the Open University and the University of London, as well as King’s itself; although graduates entering these organizations are doing so in technical and practical, roles such as analysts and e-learning professionals, rather than as higher degree research students. A US Office of the State Archaeologist, Waterstones and Oxford University Press also feature, reflecting (perhaps) MA DH’s strengths in publishing and research communication. Many of the roles which MA DH graduates enter are specialized, for example Data Engineer, Conservator Search Engine Evaluator, although more junior managerial jobs also figure. As noted, the figures on which these observations are based must be treated with some caution; and doubtless as data for 2013/4 and beyond become available, clearer trends will emerge from across the three MA programmes. Currently, there is a range of destinations to which our graduates go, spanning the private and research sectors, and there is much overlap in the types of organizations for which graduates from all three programmes work and the roles they obtain. However, two broad conclusions can be drawn. Firstly, that all three programmes offer a range of skills based on a critical understanding of digital theory and practice which can be transferred to multiple kinds of organization/role. Secondly our record on full employment shows that there is growing demand for these skills, and that those skills are becoming increasingly essential to both the commercial and research sectors. The team behind the Heritage Gazetteer of Cyprus were in Nicosia last week, presenting a near-final form of the project to an audience of experts in Cypriot history and archaeology. The resource the project has been tasked by the A. G. Leventis Foundation to produce is very nearly complete, and will be launched to the world in January 2015. The HGC has always been about the names of places, and how these names change over time. As I have blogged about previously, and as we outlined in our presentation to the International Cartographic Association’s Digital Approaches workshop in Budapest in September, this name-driven approach, which is based on three layers of data – modern toponyms, ‘Historical Units’ and ‘Archaeological Entities’ represents the limits of the current project. However what it cannot do raises important intellectual questions about how digital representations of place are organized and presented online. The aim of this post is to capture some of these questions, particularly with regard to our ‘Historic Unit’ data layer. As we take the HGC forward therefore, we propose to modify this artificial footprinting mechanism, so that an HU is rather represented by a set of thematically, but not necessarily geographically, conjoined AEs. This speaks to a much more fundamental problem of how archaeological data – bearing in mind that the HGC is about names, and is thus more a creature of history than of archaeology – is recorded. Much rhetoric of the semantic web in the discipline, at least in its earlier phases, focused on the need to link archaeological datasets ‘organically’, where data produced by one site can be linked and contextualized with that from another, without the excavation teams of either having to adopt a priori methods or procedures for data production. This may hold true to an extent, but our experience with HUs especially shows that when combining such data, some kind ofa posteriori aggregation process must be undergone. Otherwise, quite simply, one adds little to the data by linking it. In our current model, this is imposed by the user doing the aggregating; but the subjectivity this introduces is fraught with difficulties. Therefore, our next steps will be to develop our categorising and attributing capabilities for AEs, and begin aggregating into HUs on that basis. They will therefore be grown from the ground up in a way that is guided by the HGC data structure, rather than imposed from the user downwards.